The forecast for today is 40 degrees. Hot, Hot, Hot. But there's something about the early morning of a hot day which is quite beautiful, a combination of the light, the stillness, the shadows. The house is all buttoned down in preparation for the day. 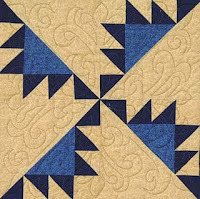 Barbara Brackman has put up her weekly block on Civil War Quilts. I was going to use the word brainteaser to describe these blocks but that's not the right word. It's not a brainteaser as it is all so beautifully clear and logical. Rather it's a teaser for your hand-eye co-ordination and your nimble fingers (or lack of them!). This is the sample Block No 5 - Kansas Troubles. I'll cut out the components today but I think I'll wait until quilt32 at Lillian's Cupboard has had time to make up her block and photograph and describe the steps before attempting the construction. One thing I've decided though is that I'll use fabrics which show up clearly against the dark green background of the cutting board. I find it difficult to align the ruler with a cut edge of fabric when it is a similar tone as the background.